IN THE FIRST part of this series, we looked at techniques that advanced anglers use to help with the pickup and backcast. These tricks enable you to shave the number of strokes you need to get your fly back on the water at the end of a drift. In this article, we’re going to look at two more advanced techniques. The first, shooting during the reach cast, will make an incremental difference in your fishing success. The second, sidearm casting, can be a revelation, not only for casting under obstacles but also, remarkably, for dead-drift fishing. It could literally change how you fish. Drag is as inevitable as gravity, but unlike gravity, it can be postponed with casts such as the reach, the curve, and the tuck. The reach cast is every good angler’s first line of defense against drag, and it’s one of the more important skills a new trout fisher learns. The reach cast moves the line upstream of the fly during the line’s descent to the water to counteract the inevitable current-generated downstream belly. In a conventional reach cast, the forward stroke must stop when the rod is high, say at eleven o’clock. And your forward cast must be very slow to give you time to execute the proper reach. The instant after the rod stops, gently reach the rod upstream as the line is falling. You should finish reaching before the line first touches the water, with the rod pointing perpendicular to the line. In other words, at the finish of a good reach cast, the line does a 90-degree bend at the tip-top of the rod. When I first learned the reach cast, I loved the longer drag-free drifts it gave me, but I was disappointed that reaching motion pulled the fly back toward me somewhat. This cost me some distance, and it meant that I had to cast over my target, occasionally spooking a fish, if I wanted to hit it. When I learned to shoot during the reach, everything changed. I was able to make a nice slack-line reach cast to fish that were farther away. So, shooting on the reach brought a lot more fish within range. To shoot during the reach, completely let go of the line the instant you begin to move the rod upstream. It is imperative that you completely release the line at this point. If you do as some instructors ask and form a thumb-and-forefinger ring or an ‘O’ through which the line can pass, you’ll have too much friction in your fingers, and the line won’t shoot very well, particularly at the slow line speed a good reach cast requires. You’ll know you have made a good reach cast when you see the line and leader running dead straight from the rod tip to the fly. If you see a slight downstream belly in the line and leader, you probably stopped your forward cast too low to the horizon. This caused your line to land before you had finished reaching and created an anchor that reaching turned into just the downstream belly you want to avoid. If this happens to you, stop your rod tip higher and sooner than you normally do. Another advantage of this high-rod-tip stop position is that it tends to tighten your forward loop, which is particularly helpful because of the slow line speed. The tight loop concentrates the energy in the line so that even with a very slow forward cast, the tight loop pulls out the slack that you want to shoot. Your directional accuracy will not be affected by reaching or by shooting. Once you stop the rod on the forward cast, the loop forms, and it is then impossible for you to change the direction in which it travels. However, it is initially a little tricky to gauge distance with the reach cast, with or without shooting. Over time, through lots of fishing casts, you’ll become pretty good at landing the fly at the proper distance. One of my fishing buddies has a common-sense fix for this. He determines where he wants his fly to be at the end of the drift, usually a few feet below the last fish or holding area he wants to present to in that particular drift. Then, he casts to that spot with a conventional cast. That’s the total amount of line he needs. Then he strips in some line, casts above his target, and reaches-and-shoots until the line pulls tight. Most fly fishers only think of the sidearm cast as allowing them to cast under overhanging trees and bushes. But it is also a potent slack-line cast because it lets you put curves and slack in the line. If you overpower the sidearm cast, the fly tends to kick (curve) to the side in the direction in which you are accelerating the rod. 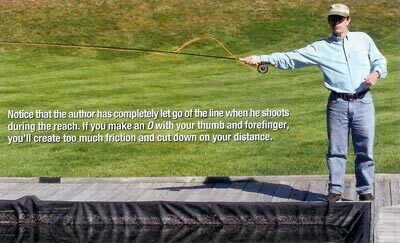 When you are casting across the current, this is another way to put the fly downstream of the line and lengthen your dead drift. Sidearm casting even opens the door to skip casting — something we’ll discuss in a future column — and to Spey casting. By the time spring fishing comes to my home water in Maine, our riparian trees have endured floods, ice storms, and winds. Some end up in the water. Those that remain standing often hang over some of the very best smallmouth bass cover in the world. During pre-spawn and right into July, when the fish are shore oriented, I do a lot of sidearm casting to get my fly into those spots that I could just couldn’t reach with an overhead cast. And on Armstrong’s and other spring creeks, I use the sidearm cast to kick my beadhead nymph around to just where I want it relative to the indicator. This is a deadly way to tune your cast so you get just the drift you want. If you’re like most people who never tried the sidearm, you’ll find it a little weird at first. All the fundamental rod motions are the same— the short stroke, the gentle acceleration to an abrupt stop — but the muscles doing them are different. As always, be patient. Get used to the idea that this’ll probably feel awkward at first and that you’ll screw up a few dozen times before it becomes somewhat familiar. To make this as easy as possible, you’ll want to learn with no more than 15 feet of fly line (excluding the leader) beyond the tip-top. Because gravity pulls things down, long sidearm casts are very hard to make. With so little clearance to begin with your rod tip travels just about three feet over the ground through both strokes— there’s just not time for a long backcast to straighten out behind you before it hits the water. Start with the line on the water or lawn and the rod pointing straight at the yarn or fly. As you make your pickup, do so by bringing the rod up diagonally, off to the side. As you ease into your backcast, make it in a horizontal plane. I don’t just mean “leaned out to the side a little bit.” I mean that the rod travels perfectly parallel to the ground. Make some false casts in this plane, keeping your casting hand at exactly the same level— no higher — as your elbow. One of the errors I often see when I teach this cast is that the casting hand doesn’t move much, and the wrist does most of the work. You’ll have best results if you make your hand travel at least 18 inches during each casting stroke, as though you are making a snow angel with your forearm. If your usual overhead casting style is like mine, with your torso square to your target, you’ll have an easier time if you turn your torso out toward your rod. To do this comfortably, drop your right foot back and look toward your casting hand as you cast. Otherwise, your shoulder will have to open out a lot on the backcast, which will feel awkward. Another error I see is that some people contort themselves over this cast: they bend way off to the side at the waist. Remember that a good sidearm cast can be done with your torso upright and comfortable. If you need to make longish sidearm casts, swivel your torso slightly with both the backcast and forward cast, as though you are watching a tennis match from the net. This will give you more line speed, more comfortably than you can generate with a fixed torso. You’ll also need to bring the rod up somewhat from horizontal to give the longer line more ground clearance. These two techniques are little things that experts do that most intermediate casters don’t. The sidearm allows them to fish some water that you may now think is out of bounds. But wouldn’t you love to get your fly into some of those brushy places that have so far just eaten your flies? And shooting on the reach cast will give your dead-drifted flies greater range. It’s a great feeling to look out over the water in Hopper Heaven and know that you can fish so darned much of it!